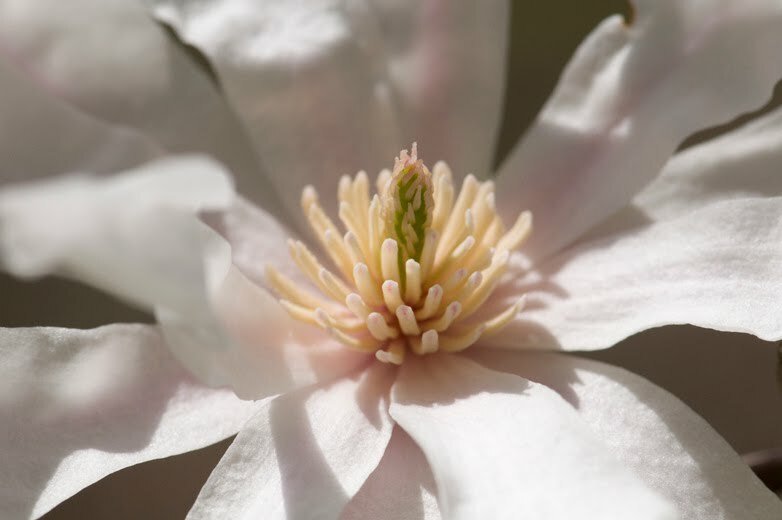 Last Wednesday I headed over to Haw Ridge to see what might be in bloom. 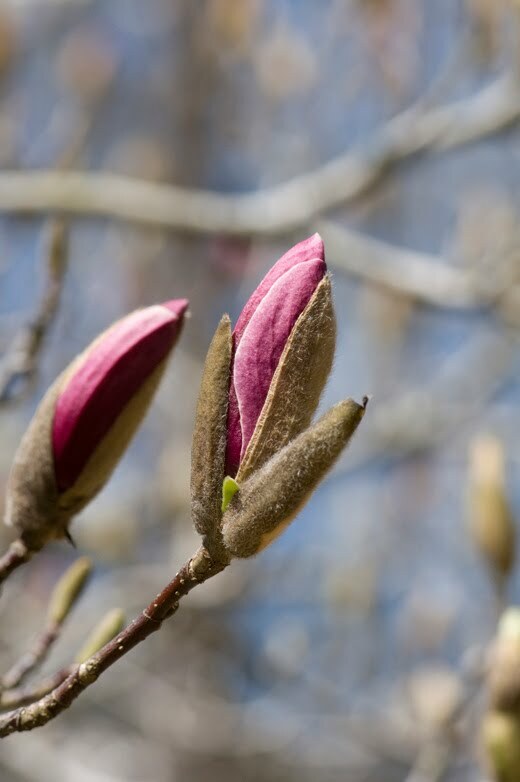 The flowers are about 2 weeks behind this spring due to the colder-than-normal winter we had. I was happy to find Bloodroot, Round-lobed Hepatica (left), and some Rue Anemone (right). 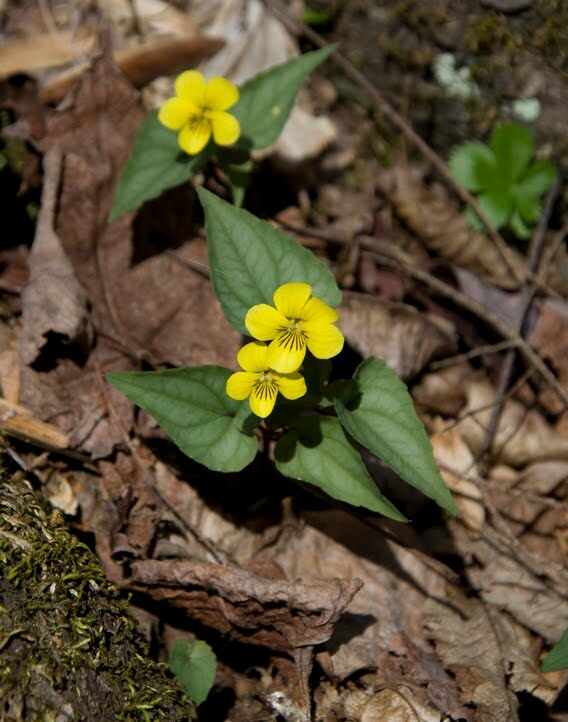 Some of the other flowers included Spicebush, Bluets and Toothwort. I got distracted a couple of times by the rocks along the trail. 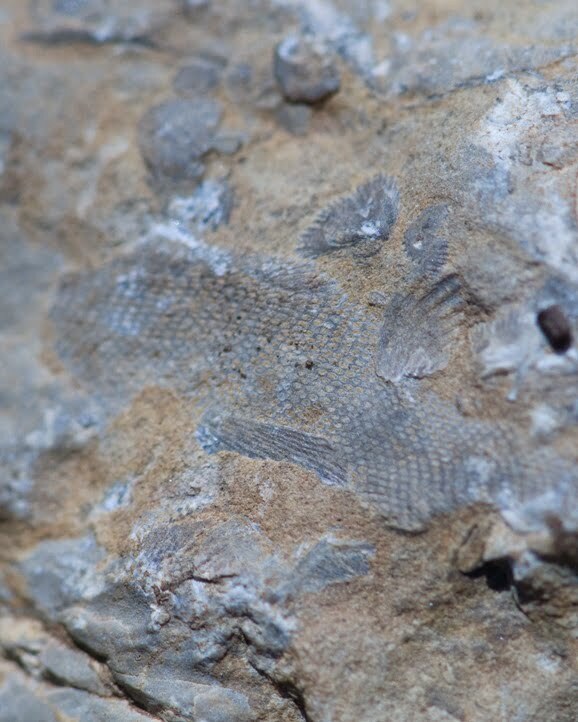 Many of the limestone rocks are loaded with fossils of bryozoans and brachiopods (shells). Using my mac ro lens, I was able to see the tiny holes where the ancient animals once lived. The next day I went to the science museum to pick up the equipment for my class the following day. 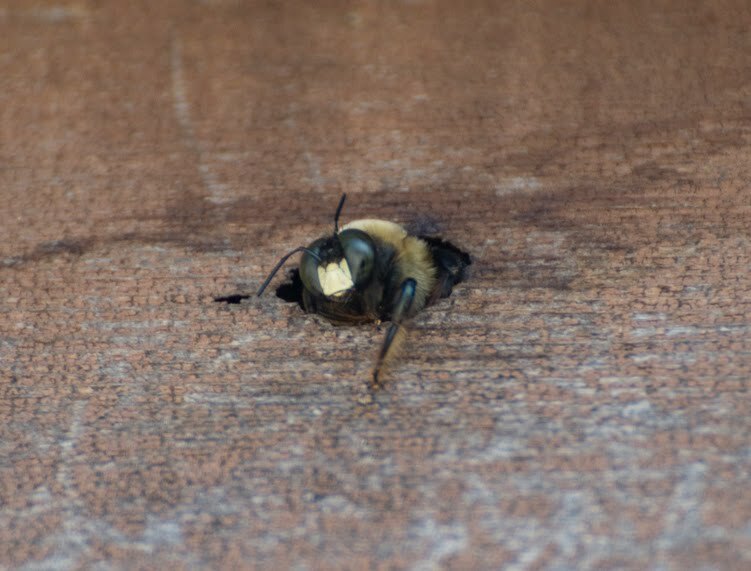 As I was loading the car I noticed several large carpenter bees flying into holes they have bored into the wood along the roofline. 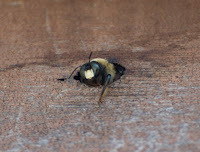 I grabbed my camera and snapped some shots of the bees as they peered out of their nest holes. These little gals can do a lot of damage to wood when they make large tunnels. As I wandered along the bank of the pond I heard frogs plopping in the water as I approached. Those little critters are so hard to see! Suddenly I saw a brown head sticking out of the water at the edge of the pond. 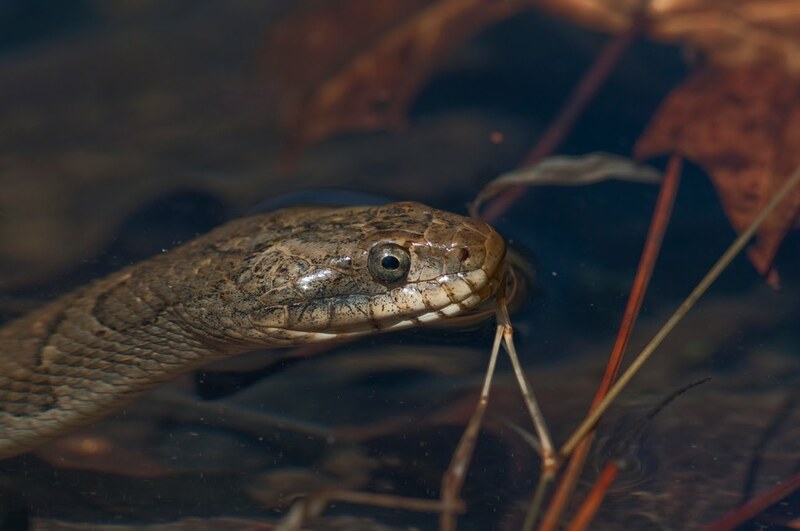 I was happy to see it was the Brown-banded Watersnake that I have enjoyed seeing over the past few years! I knelt slowly and snapped pictures to see how close it would allow me to get. It must be fairly used to people, it let me get within 18" before it swam away. These snakes are not venomous (or "poisonous"), they eat frogs and fish. I wanted to get a photo of it with its tongue out, but I wasn't fast enough! Even if you don't like snakes, you have to admit, that face is adorable! :) It seems to have a smile! 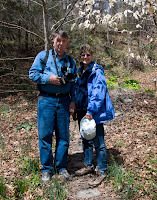 Yesterday Kenny and I went hiking in the Smokies with ou r friends Terri, Rod, Gary and Jana. We took a different route to go there so we could avoid the traffic in Sevierville, Pigeon Forge and Gatlinburg. Hwy. 416 was a pretty, scenic route through the country until we had to detour due to an overturned cement mixer in the road! The detour was winding and quite narrow in places (especially where the road became one lane!). One redeeming thing about the detour was getting to see a little covered bridge that Gary knew about. 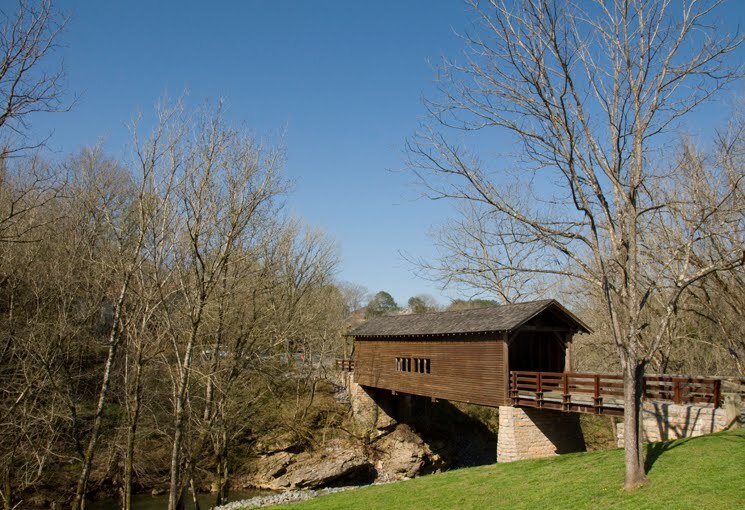 It is called the Harrisburg Covered Bridge. It was built in 1875 and restored in 1975 and again in 2005. We arrived at the Porter's Creek trail about 1/2-hour later than we had hoped. 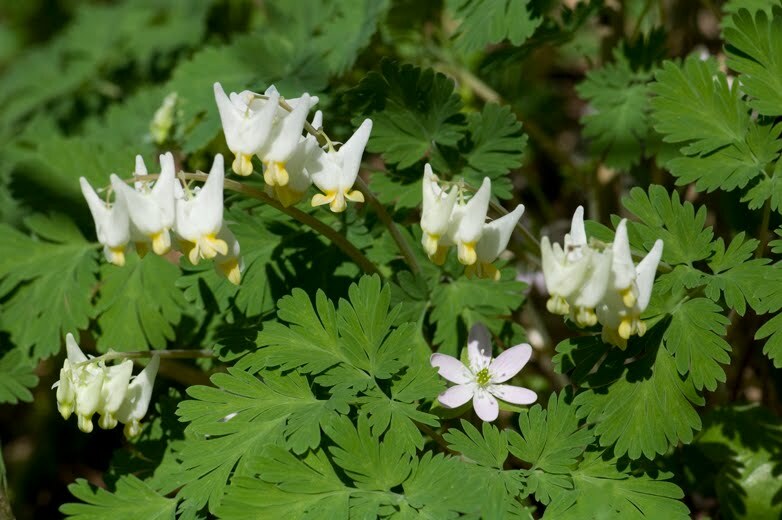 This trail is one of the best in the park for spring wildflowers. A lot of other people had the same idea we did about seeing the blooms, there were car s from all over the eastern US! I'd never seen that trail so crowded. 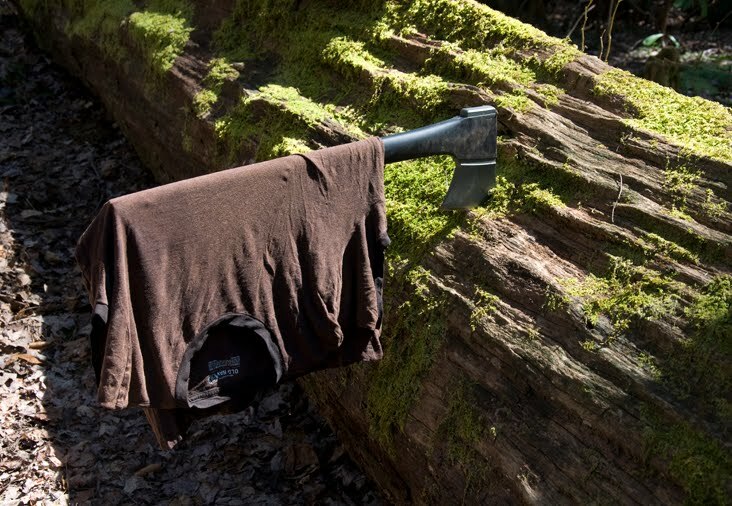 Since it is a 3.7-mile hike to the campground, it wasn't overly crowded. 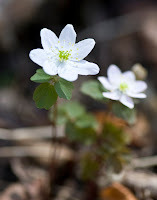 We saw Bloodroot as soon as we opened the car doors. 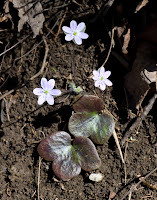 Along the trail we soon spotted Halberd-leaf (left) and Round-leaf Yellow Violets (right), Wood Anemone, Sharp-lobed Hepatica, and Carolina Spring Beauty. 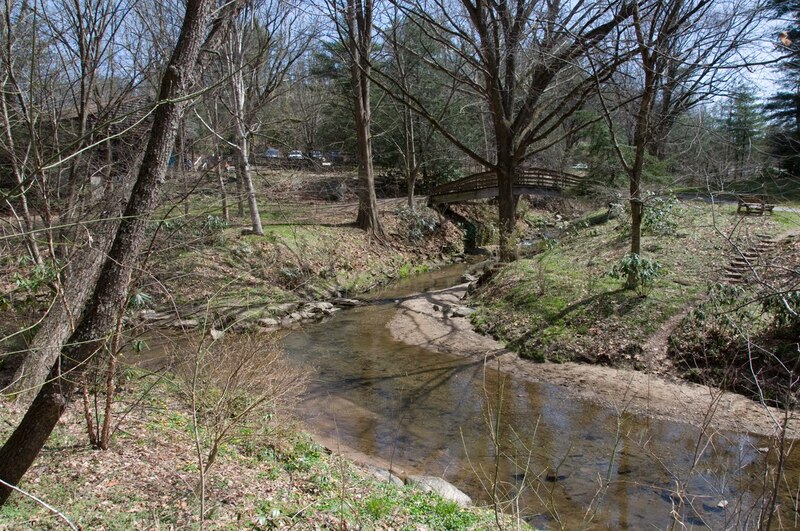 The trail follows Porter's Creek and crosses it a couple of times. After the last bridge, the scenery takes a turn for the better. The hillside and the woods below the trail is covered in many kinds of wildflowers, including Hepatica, Spring Beauty, Dut chman's Breeches, Trout Lily, and Frasier's Sedge. The forest floor is covered with wildflowers in that area, soon the Fringed Phacelia will look like snow on the ground. We ate lunch at Fern Branch Falls. I was excited to see a gun-metal blue Oil Beetle crawling across the moss near the stream. 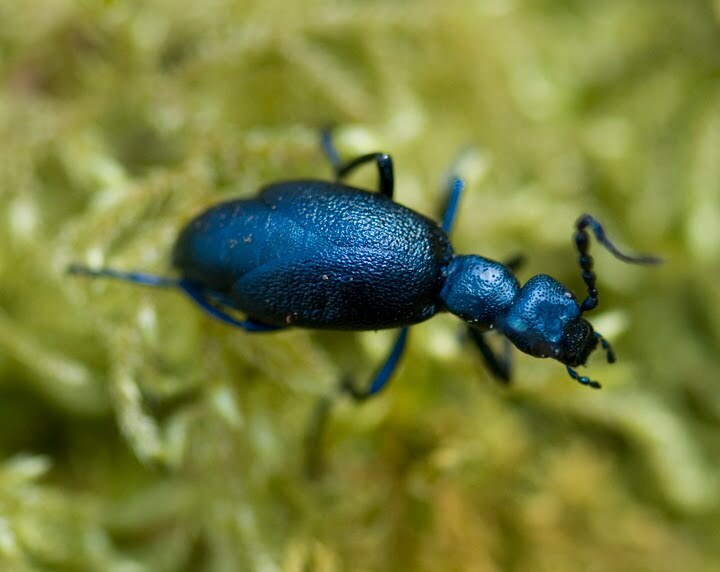 These beetles have the most interesting and unusual antennae. Some of the other insects we saw were small blue butterflies and a few anglewing butterflies (either Commas or Question Marks). One kind of insect we were NOT happy to see were the thousands of terribly annoying little bees that crawled all over us and even stung us a couple of times! They looked like large sweat bees. 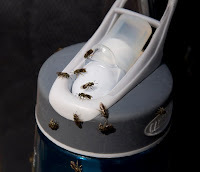 Here is a photo of them crawling all over my water bottle! :( They were everywhere --- on the ground, on the trees, and even on us! We had never seen these insects before. Maybe the 80 degree weather brought them out early! New flowers, a new friend and a new book! Ever since I first saw Oconee Bells (Shortia galacifolia) in a wildflower book, 20 or so years ago, I have wanted to see them up close and personal. 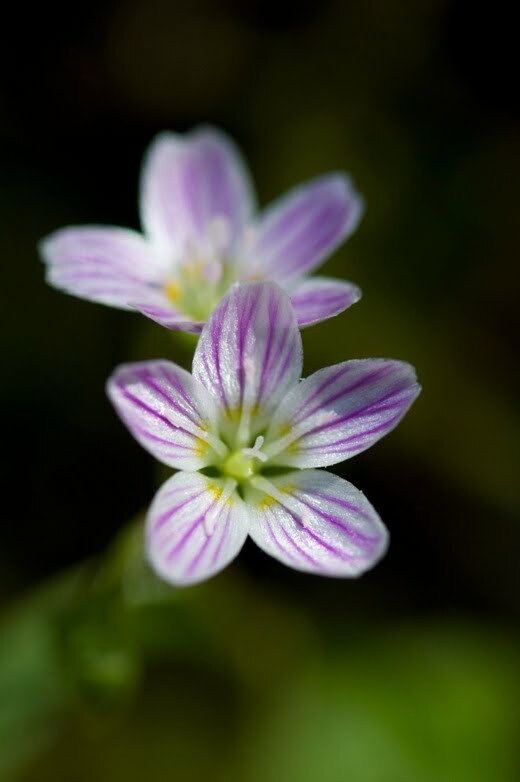 These beautiful little flowers are on the endangered species list. Thanks to o ne of my wildflower enthusiast email contacts, I finally got the opportunity to see some yesterday! My friends Terri and Rod drove over to North Carolina to go to the Botanical Gardens at Asheville . Since Interstate 40 is closed between here and there due to a monstrous rockslide, we had to take Hwy. 25 over the mountains. It was an interesting route, some scenic views - the French Broad River and the Smoky Mountains, and some not so scenic - front yards being used as junk yards. 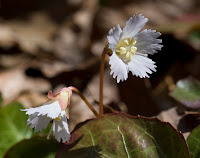 I had learned about the Oconee Bells from Larry T., a western NC fellow I've been corresponding with the past year o r so. He met us at the gardens and gave us a tour. As our group was walking along the trails we enjoyed seeing Bloodroot, Spring Beauty, Sessile Trillium, and Hepatica. I jumped for joy when I finally spotted the "stars of the show" and my whole reason for making a 300+ mile round-trip --- the Oconee Bells! They were even prettier than I had imagined! They are only 3 - 4" tall and have leathery, evergreen leaves. The anthers have an interesting shape and the fringed petals are so lovely. The garden has only one patch of them, about the size of a king-size mattress. These plants were rescued from a construction site many years ago. Fu rther down the trail we saw Marsh Marigolds blooming in a spring seep up on a hill. 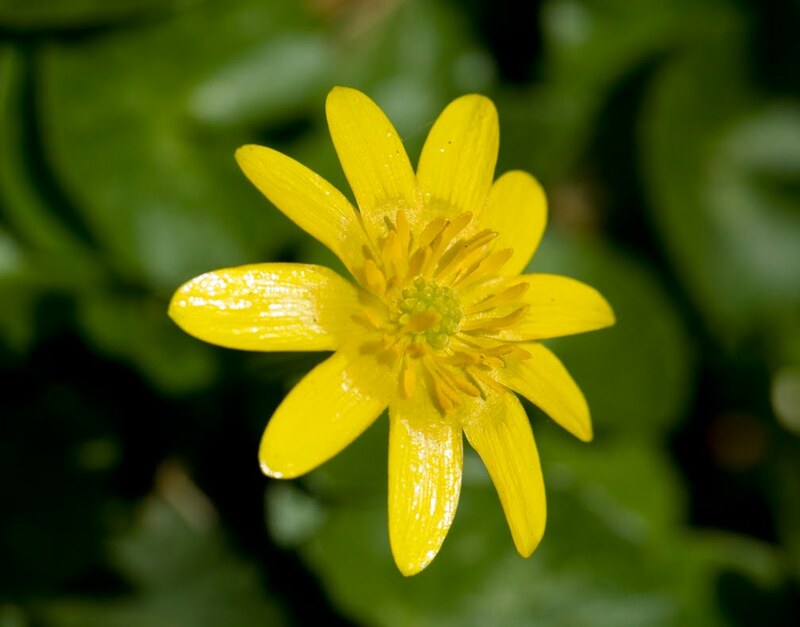 These bright yellow flowers are a type of buttercup and are not related to true marigolds (which are in the Aster family). Nearby were some Skunk Cabbage plants, they bloom very early in the spring (sometimes even through the snow! ), there was only one nearly dried up flower left. I'll have to go back there in February to see them in bloom next spring. After enjoying the gardens for a couple of hours we headed to downtown Asheville. 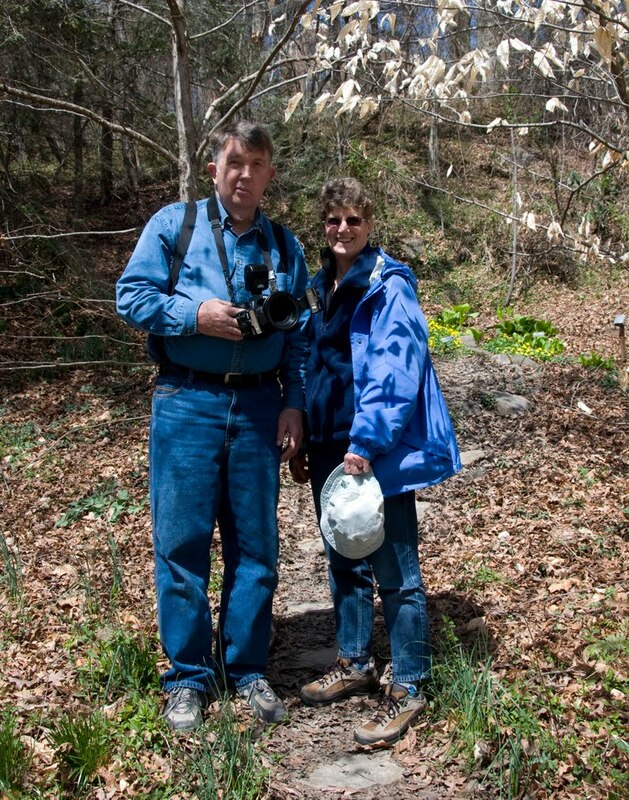 Fortunately, Rod and Terri have been there several times and were able to help me navigate. We enjoyed a cup of coffee at the Double Decker Bus cafe. What a nostalgic place to relax and chat. A quick glance at the museums and a visit to the Mast General Store didn't last long enough, the parking meter was running! 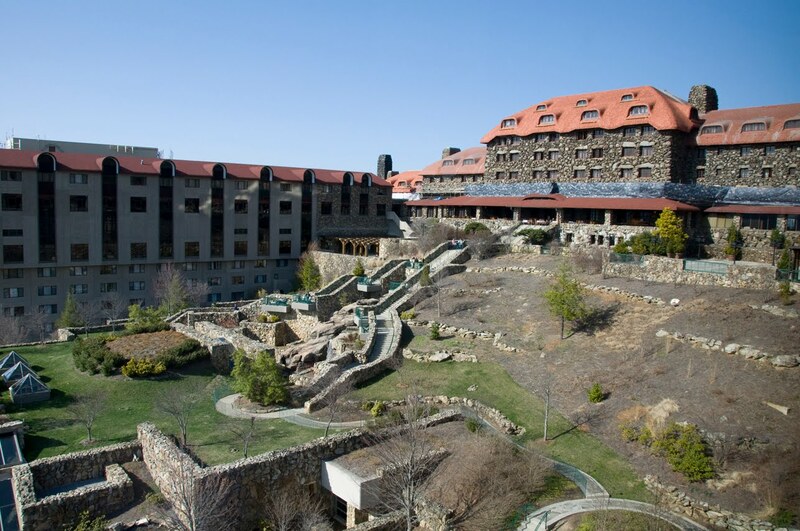 Our next stop w as at the elegant Grove Park Inn overlooking Asheville. This rustic, nearly century-old lodge was a very enjoyable way to finish our day in the city. I was amaze d at the huge boulders that were used in the exterior walls and the fireplace masonry. 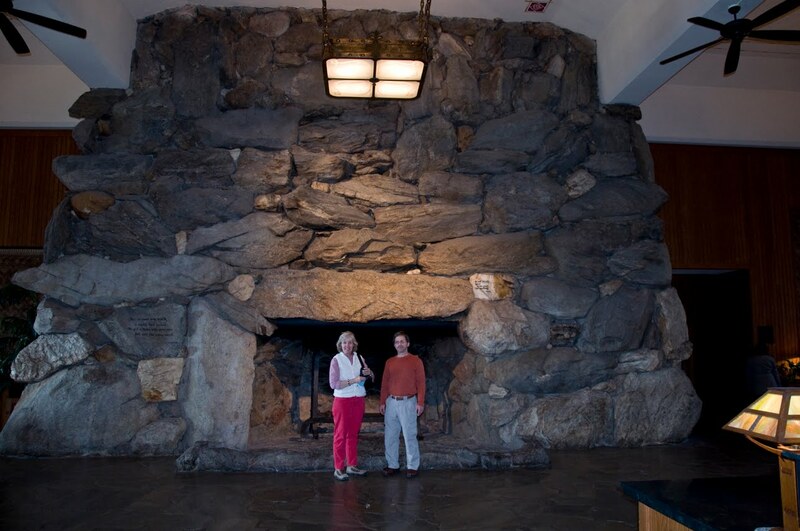 I had Terri and Rod stand in front of the fireplace to show its massive size! There was another, equally large one on the other end of the lobby! The inn was undergoing roof renovation, so there was a lot of scaffolding on the front, this view shows the back side of the inn with the cascading waterfall and gardens. In a few more weeks, the gardens will be spectacular. We enjoyed watching a flock of wild turkeys stroll across the golf course as we stood on one of the outdoor balconies! We drove back to Knoxville by way of Cherokee, NC on Hwy. 441 over the Smokies. Terri and Rod got their first glimpse of an elk grazing in a nearby field as we passed the Oconoluftee visitor center at the entrance of the park. There was still quite a bit of snow up in the higher elevations of the park, but the roads were clear. Driving along dark, curvy Little River Road after dark is a challenging experience! Once a raccoon ran across the road in front of the car, then minutes later a bat darted out and nearly hit the windshield. :-0 Our trip ended up being 14 hours long, but we had a great time! This book is excellent! 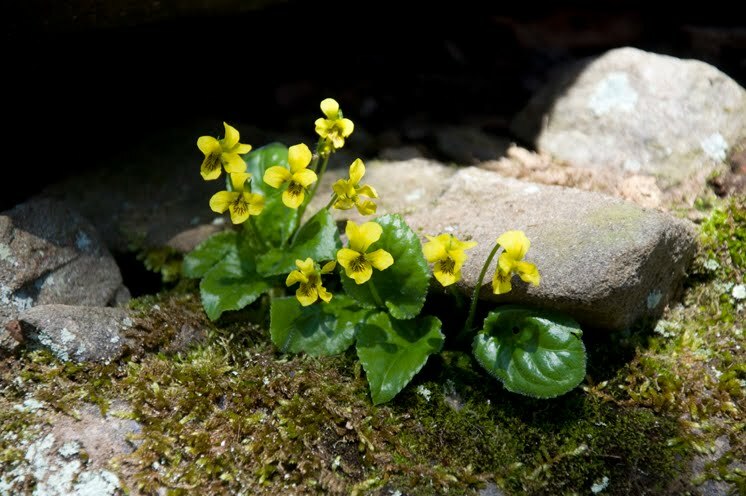 It is an absolute MUST for anyone who has ever come across something strange outdoors and wondered what it was (galls, small tracks in the mud, or eggs, for instance). Now I know that those jet-black egg masses that the kids find on blades of grass during science camp are deerfly eggs! (I may smash them from now on!!!) This book is going to be a tremendous help in my outdoor nature classes. A big congratulations to Charley and Noah on their hard work and getting it published!